If you’re having fun using Tinder or Bumble at home, there is no reason to stop swiping just because you’re heading off on a trip. An increasing number of travellers are using dating apps to meet fellow explorers, or locals who can show off the best of their city. And you never know what might happen; a lasting friendship, a unique experience, a hot international hook up, or even meeting the love of your life! So go ahead and put yourself (and your profile) out there! Don’t swipe right if they have a photo in the bathroom/gym with their shirt off and earphones in. Go for friendly looking over hot! No matter how long you intend to stay in a city, you can still have some fun dates along the way, and it’s a good idea to set your profile up a week or two in advance. You could even set up a date before you land! Urszula Makowska is an actress and blogger from New York, and travels a lot for work. “With every city that I travel to, I’m always interested in meeting new people, learning about the culture and history, and trying out the local food. Unexpected, but lasting friendships can spring up all over the world. And dating in another country can also make a refreshing change to the boys and girls you meet back home. Brooke, a teacher from Arkansas has made some amazing connections whilst travelling in Europe. “Over my three weeks in Portugal, I met some lovely men who I now consider friends. I particularly remember Paulo in Tavira. We connected on Tinder and met for drinks at a hotel bar that was a short walk from my apartment. I was on high alert because, well, a hotel bar seemed a bit suggestive. However, what I found there was an impeccably dressed gentleman sipping a gin and tonic in an exquisite setting. This renovated convent was steps away from where I was staying, yet I would never have discovered it (Hotel Convento Da Graca) without the help of Paulo. We sat for hours amid the archeological remains chatting about the educational systems of the U.S. and Portugal. Being a teacher, this was a genuine highlight for me. He, like the other Portuguese men I met, was genteel, chivalrous, and fiercely proud of his country. When you’re setting up your profile for an international date (exciting! ), there are a few extra considerations. • Be sure to make it clear what you’re up for from the outset. • Start swiping before you leave! Save time and start planning before you get there. • Always respect the local culture. Homosexuality is still a taboo subject in some countries, and even illegal in some, so be mindful of this when you’re editing your profile. It’s funny how instant and genuine connections can be made when travelling. We all travel for different reasons, and a change of scenery can work wonders. Add to that the frisson of a date and you might even meet someone who can rock your whole world! Even if you’re not looking to meet the love of your life right now, you can still make meaningful connections. Which sometimes, can come along at just the right time. So whether it’s a hot tango date in Buenos Aires, or rooftop cocktails in Bangkok, your life (and trip) could take an unexpected turn for the better. Happy swiping! Gemma Thompson is a writer and broadcaster and specialises in solo female travel. You can find planning tips, city guides and inspiration at girlsthattravel.com. 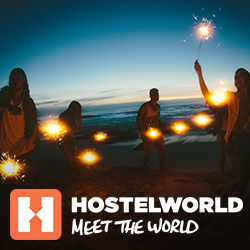 The post The unexpected benefits of using dating apps while travelling appeared first on Hostelworld Blog.